I always thought I'd be a Mum of two girls and if I ever had any more children in future, they'd be girls. I never saw myself being a Mum to a boy, even though I've always wanted a little boy. This month last year, I found out I was pregnant with my third child, little did I know 14 weeks later, I was carrying my first little boy. I was filled with excitement and nerves. My pregnancy didn't feel real until the last ten weeks when I had to visit hospital 2-3 times a week for appointments due to my liver disorder (Obstetric Cholestasis). There were many times I'd get emotional and wondering how I will cope with three children? I was worried that I would go through depression again and afraid of pushing the girls out. Freddie has been in our lives for over three months now, and it's like he's always been here. We couldn't imagine life without him now. He's just the amazing son and little brother ever. There are many things I've fallen behind on such as blogging and housework but Freddie only a baby once. He doesn't sleep much during the day, and if he does, then I'm lucky if it's even an hour. I try and get some things done while he is happy in between his feeds. Life is a lot more hectic with three children than it was with two. When I'm feeding Freddie, I tend to find the girls can play up or argue with each other which sometimes I have to stop feeding Freddie, which he then cries, so I can go and calm the girls down. When I get back, I need to calm Freddie down and feed him again. That can happen most days, and it can get stressful. Some days I feel like I'm breaking down, but I must admit it is easier than I thought, but that doesn't make the hard days any easier. I am constantly on my feet or feeding Freddie, and it is hard to have some time to myself when I am constantly on the go all day. But now that Freddie goes down to sleep around 9 pm, I can unwind and relax before I go to bed myself. Watching the girls bond with Freddie every day is just amazing. Of course, there are many times where I have to tell them to be careful and to leave him alone because they can be so annoying at times. 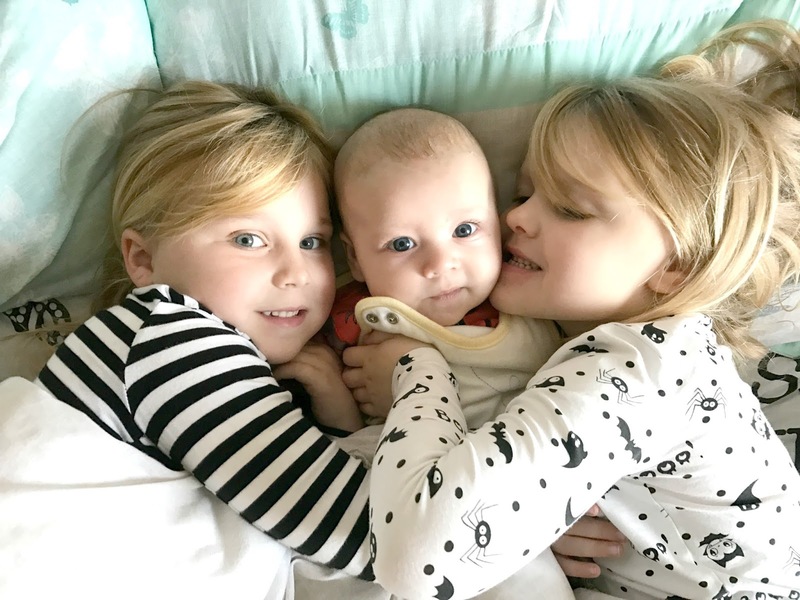 Freddie has started to take notice of them both recently, and it's nice to see him full of smiles when he sees his sisters. Each morning the girls will get into bed and say stories to Freddie. Life with three is pretty crazy but also amazing.